Englewood resident Ruthie Carpenter and her son Carl. She said vacant houses attract break-ins and drug use, something she’s seen on her block. In 2012, Chicago Mayor Rahm Emanuel announced a plan to curb criminal activity in and around vacant buildings by demolishing them. Crime is dropping, but some residents think it’s at the expense of their property value. They worry it’s making it harder for the housing market to recover in their communities. And there’s not one easy solution. On a quiet Sunday morning in Englewood, a boarded up window was decorated with streamers, advertising an open house. But the door was locked and no one was around to show it. Across the street, Ruthie Carpenter was unloading some groceries. She looked at the boarded up houses on her block. “I don’t know what they plan on doing for these lots, but it make the neighborhood look really, really bad,” she said. 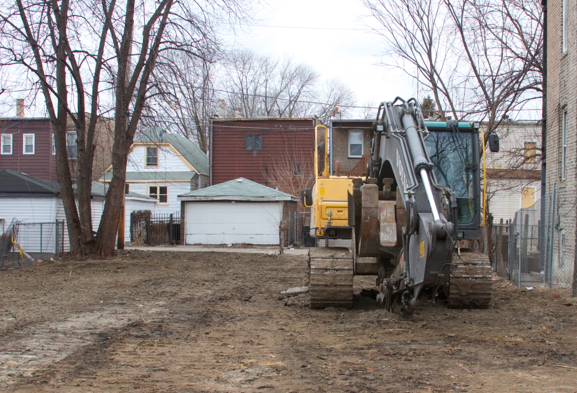 A house down the street was leveled just a few months ago under the city’s safety initiative to demolish vacant properties that attract criminal activity. The strategy initially targets the 3rd, 7th, 8th, 10th and 11th police districts--areas on the South and West Sides. She said the vacant houses attract break-ins and drug use, something she’s seen on her block. It’s typical in Carpenter’s neighborhood to see rows of abandoned houses and vacant lots and there similar views in parts of the West Side. That’s where Shavonta Washington lives. “I was just recently living at a foreclosed home where I was renting there. But then somehow, the whole building went under foreclosure without me knowing, but I was still paying rent. At the end of the day, I still had to leave my house and didn’t know where to go,” she said. It burned her to see long abandoned homes or vacant lots where a building once stood when she’s been struggling to rent a single room for her and her 4-year-old son. “Look at these empty lots. Y’all could build this up and put them poor people in there and have them somewhere to go. Because we know other people are laying down in their beds while we have to struggle and find somewhere for us, our child to sleep,” she said. Under the city’s safety initiative, about 300 buildings have been demolished because of high crime. According to the city’s buildings department, an unstable structure, a badly damaged roof or a house stripped of its wiring could be put it on the radar for demolition. It costs between $18,000 to $24,000 to level one house, and the entire process can take longer than a year. So demolition is used as a last resort. Geoff Smith with the DePaul Institute of Housing Studies said there’s a delicate balance to strike in taking down a house in a blighted area. “For the most troubled buildings, where there really is no redevelopment opportunities available and that building is sort of beyond a reasonable rehab within a certain cost for that neighborhood, demolition is an option both to help stabilize the neighborhood housing market to help improve safety,” he said. Smith said there’s very little demand in these neighborhoods. For example, the median sale price for a home in Englewood is $45,500. The city’s overall median sale price is $225,000. Though the price index for these areas have hit a bottom, Smith said there’s a small glimmer of hope with the market starting to slowly recover. “That is a slight positive indicator, but it really has to be something we see over an extended period of time to have confidence that this is a real trend and not just a blip in prices that’s being created by property flippers,” he said. The city’s Department of Housing and Economic Development said it has more than 15,000 vacant lots in stock. It wants to get rid of these, but it’s not so easy. It’s hard to get someone to buy property in a depressed area, no matter how low the price is. Plus, there are more lots beyond the city’s stock. Those might still belong to the original owner. In East Garfield Park, Luly Gutierrez was tending a garden next to her building. “There was plenty of stolen cars in the back, most of the time garbage and it was not useful for anything,” she said. Four years ago, she and her neighbor got fed up with the mess they were living next to. They got the go ahead from their alderman to turn it into a community garden. Gutierrez said people have stopped dumping their trash there. “People respect the garden. I don’t want to fence anything here. People can go back and forth. If you put a fence, it’s like ‘don’t go there.’ It’s not, it’s a community garden and people can go pass. And there are some people getting some tomatoes and that’s fine. It’s for everybody,” she said. She said her block has been looking better. There are some newer rehabs on the block, nicely finished brick condos. But there’s still room for improvement. Including a huge vacant lot Gutierrez points out across the street. She said there are more lots than hands to take care of a garden. Geoff Smith with Depaul said any redevelopment or stabilization strategy needs to be planned with a long term view. “I think a demolition isn’t necessarily going to have an immediate positive impact on the surrounding property values. But I think if its demolition takes place as part of a broader strategy to redevelop that area, then I think in the long term, that makes sense,” he said. Smith said it’s difficult to picture a community garden among many vacant lots or one rehab on a block of mostly abandoned houses capable of reversing a steep, downward trend. But it’s still a small step in a much larger recovery effort. “When you look at what attracts future investment or what attracts investment is amenities. And that’s community in some cases. And I think it’s community that might make a renter in a neighborhood choose to buy in that neighborhood,” he said. Smith said, overall, prevention is the best way to keep neighborhoods stabilized. That means keeping properties occupied. For now, Gutierrez said there are people like her trying to take care of what’s around them. “There are so many empty lots in East Garfield Park and they’re sitting there with nothing. People want to do something and they are doing it,” she said. The Chicago City Council recently passed an ordinance that prevents banks from evicting paying renters from foreclosed buildings. And Cook County is at the beginning stages of establishing its land bank, a strategy to cut down the current stock of vacant properties. Map of addresses where buildings were demolished as part of the city&apos;s effort to reduce criminal activity.